Close on heels of the CBI raid on the official premises of Sabrang Communications and Publishing Pvt Ltd, top human rights defender Teesta Setalvad has declared that the organization she and her husband, Javed Anand head "has broken no law", qualifying the raid "political vendetta". In a statement circulated through South Asia Citizens Web, Setalvad has quoted Foreign Contribution Regulation Act (FCRA), 2010, to prove her point. Setalvad says, Section 3 of FCRA, 2010, which is being cited to suggest that she has violated law, actually bars "political parties and its office bearers, government servants and those associated with registered newspapers and those involved in the production and broadcast of news from receiving foreign donations." Indicating that Sabrang Communications was registered keeping in view Section 4 of the FCRA, Setalvad said, this section applies to "persons to whom section 3 shall not apply". Section 4 states states: "Nothing contained in section 3 shall apply to the acceptance, by any person specified 3 in that section, of any foreign contribution where such contribution is accepted by him, subject to the provisions of section 10- (a) by way of salary, wages or other remuneration due to him or to any group of persons working under him, from any foreign source or by way of payment in the ordinary course of business transacted in India by such foreign source." 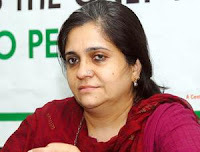 Setalvad said, "Sabrang, which published the monthly ’Communalism Combat’ signed a Consultancy Agreement with Ford Foundation in 2004 and 2006 'to address the issues of caste and communalism' through a clearly defined set of activities", and these activities had "nothing whatsoever to do with 'Communalism Combat' or remuneration to Javed Anand or Teesta Setalvad towards discharging editorial/managerial functions". Setalvad said, deliberately or otherwise, officials are confusing political lobbying of the that takes place in the US "with advocacy initiatives whereby NGOs engage with the government", in which "attention is drawn towards the legitimate issues of women, children, Dalits, religious or linguistic or sexual minorities, differently-abled persons etc." Setalvad insisted, "The consultancy was signed by Sabrang only after advice from eminent legal counsel that such an agreement was covered under the exclusion stipulated under Section 4 of the Act and therefore the consultancy fees (not grant or donation) received would not be in violation of FCRA, 2010." She added, "Ford Foundation in fact deducted TDS with every installment of consultancy fees it paid to Sabrang. The activities undertaken and the expenses incurred were in accordance with the agreement. Activities and Financial Reports were submitted annually to the satisfaction of Ford Foundation." Pointing out that CBI was "misreporting its search of her house and office premises on July 14, 2015, Setalvad said, even when the CBI search was, its "Delhi spokesperson is misleading the public and our vast supporters by a series of misinformations and officials tweets." Setalvad underlined, "This is a continuation of the persecution and witchhunt first launched by the Gujarat police in 2014, then under the dispensation that rules Delhi. The CBI has taken the same documents that we had voluntarily on inspection given the MHA (FCRA department)." She added, "Over 25,000 pages of documentary evidence has been given to the Gujarat Police. When they could not succeed with the bizarre and desperate attempts to gain custody (February 2015), it was the Gujarat government home department that wrote to the MHA and the current round of the persecutions began." Calling it "shameful political vendetta", Setalvad said, this was planned, because "the Zakia Jafri case begins its final hearings on July 27, 2015" and "the Naroda Patiya appeals (Kodnani and Bajrangi) are being heard in the Gujujarat high Court on July 15. This is nothing but a bid to subvert the cause of public justice and ensure that no justice happens in these cases." According to Setalvad, this search is nothing but an attempt to divert attention from scams like Vyapam, in which over 50 persons have died, and the death of witnesses in Asaram Bapu case. She said, "CBI is not appealing in critical cases related to crimes by politicians; the agency is being unleashed on human rights defenders standing up for the rights of survivors of mass violence."